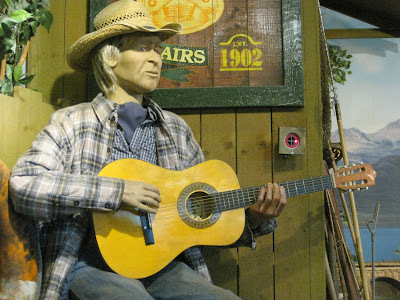 Readers may recall our recent post featuring Jack, Teddy, Ronnie and Co at Scheels in Nevada. One of the other "attractions" at the super-duper sporting goods emporium is this backwoods-themed shooting gallery. ex-prez or what, but the guy on the porch here sure looks a lot like a former decider-in-chief to us. Just a wee bit surprised that the guitar/player does not sport a target . . . .